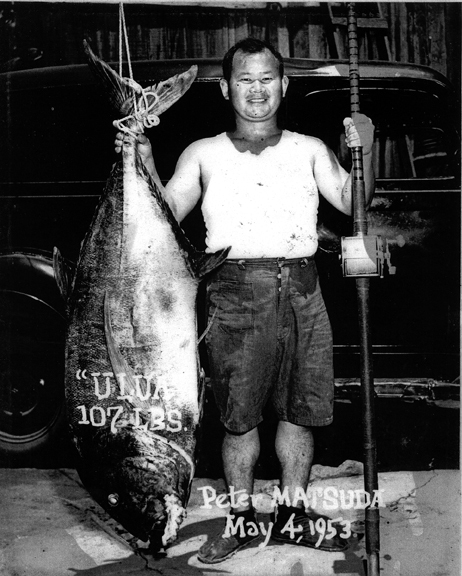 David Matsuda,writes, "This 107-lb ulua was caught on May 4, 1953 at Cut Mountain near Lahaina, Maui by my dad Hideyuki Peter (ABC) Matsuda. He is 95 years old now. "He caught the ulua with an ulua pole he made with Indian bamboo. The reel that he used was a Penn with linen fishing line that had to be washed and dried in a basket every time it was used. The weight of the line may have been between 60-80 lb test. "The witness for this catch was my grandfather, Otchiko Imamura, who is deceased. He told my dad to go home on that night; it was too windy. Dad told him 'A little while more,' then he had the strike. He thought it was a shark at first. "My dad told me picture that I am sending you was taken by someone from the Maui News."